“I can bet you all the (little) money I have that anyone from the former Soviet Union reading this recipe will have a huge smile on their face and a sense of childlike excitement thinking of their favourite holiday – New Year’s Eve,” says food writer and Russian cookbook author, Alissa Timoshkina. “This dish is essentially synonymous with the feast on December 31, as it is one of the several iconic starters to adorn the festive table, along with Russian salad (aka the Olivier salad) and meat in aspic, called Kholodets. 1. Preheat the oven to 180°C fan/Gas Mark 6. Rub the beetroot with a little oil and sprinkle with salt, then wrap in foil and roast for 30 minutes or until cooked but retaining a bit of crunch – pierce to the middle with a knife to check. Let the beetroot cool down, then peel and cut into eight wedges. Dress with a bit of oil and salt and set aside. 4. While the vegetables and eggs are cooking, make the dressing. To obtain a small shot of beetroot juice, you can either use a juicer, or finely grate a small raw beetroot and strain the pulp through a fine sieve. Stir it into the crème fraîche in a small bowl. The amount of juice you add to the crème fraîche is really up to you, depending on the colour you prefer, but about four teaspoons will turn it the most delightful light pink colour. Add the garlic and season with salt and pepper to taste – I usually add two pinches of sea salt flakes, which is less salty and iodine-tasting than standard table salt. 5. Once the vegetables and the eggs are boiled, assemble the salad. Place two dollops of the crème fraîche dressing on the plate and spread it over evenly. Serve the rest in a bowl on the side. Cut the herring fillets into bite-sized chunks and scatter around. Add the beetroot, potatoes and carrots, making sure you are not overcrowding the plate, so I will leave the exact amount of each vegetable to your judgement and the size of the plate or platter on which the salad will be served. Shell the eggs and cut into wedges, then place them on the plate, adding more texture and colour to the composition. I met @borsch_and_no_tears almost 14 years ago during our MA studies at Queen Mary. I still can’t believe we diverged from academia and both ended up cooking. And now her brilliant debut cookbook #SaltAndTime is nearly out and I feel so thrilled. The writing is intelligent, poetic and funny (very much a reflection of her). The food looks delicious and there are so many dishes I have never encountered before. I cannot wait to cook from it and I have already read it cover to cover. I cant recommend it enough. So happy for you my friend - what a year for you. PS We are cooking together on March 29th at @benkandbo please come eat our food! PSS Mum, before you scold me - the tiles are worn, not dirty! 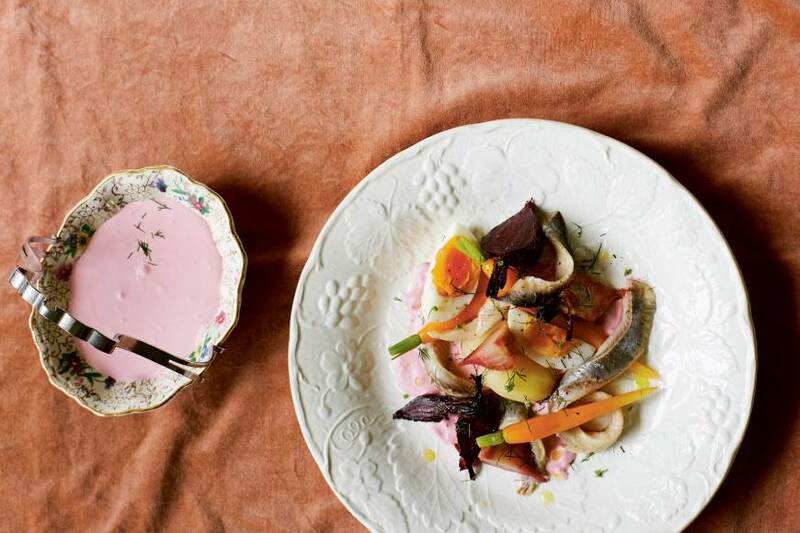 Salt & Time: Recipes From A Russian Kitchen by Alissa Timoshkina, photography by Lizzie Mayson, is published by Mitchell Beazley. Available now.